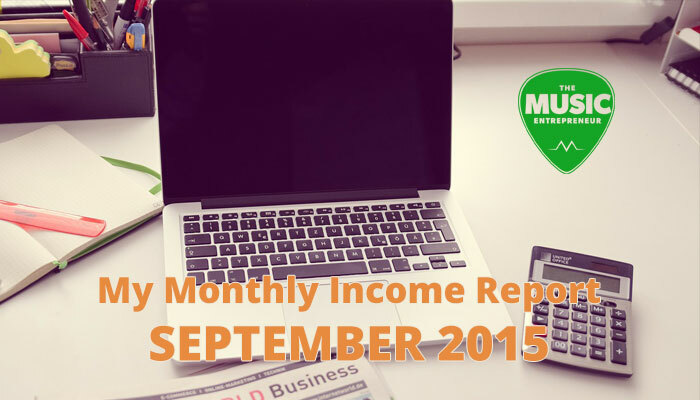 It’s time for another income report. September was not an explosive start to fall by any means, but it was still a solid, profitable month for me. It’s actually the second biggest earning month I’ve reported on so far. In particular, music instruction was still a little on the slow side, but it has been picking up here in October. So let’s get into those numbers, and I’ll fill in any gaps at the end of the post. The income represented here is from the music industry only. I could probably live on what I make here if I had to, but I have several other income sources. You can also read about the exact science behind these numbers in my first income report. I still haven’t seen any sales reports for my eBook, which is kind of disturbing. I have a feeling my distributor might be dropping the ball on this one. I better be getting a notification here soon. On another note, if you’ve been following me from the very beginning, then you know that this project (the podcast and blog) began as a marketing tool for my music career. Then, in 2011, I started forging it into a business rather than just a hobby. This transition has not been proving to be an easy one. However, in the last year or so, I have started offering a variety of resources, and I’ve also started soliciting podcast sponsors. I have plenty of other ideas to implement, but it seems traction is hard to come by. It could be that I have a branding problem and not enough focus (too many brands!). It could also be that I just haven’t found the right offer (as in product or service) yet. However, my desire to build a business hasn’t changed, which is why I’ve been thinking about starting a new business. I’m capable of so much more. Don’t worry, I’m not going anywhere. I’m just being open with you and speaking my mind. Anyway, you’re welcome to share your thoughts with me in the comments, and if you’d like to check out last month’s income report, you can click here.